This article describes an eclectic set of 28 mm miniaturesfrom Ginfritter's Gnomish Workshopand Mega Miniatures.Even for my strange tastes, this is quite an unusual set of miniatures. 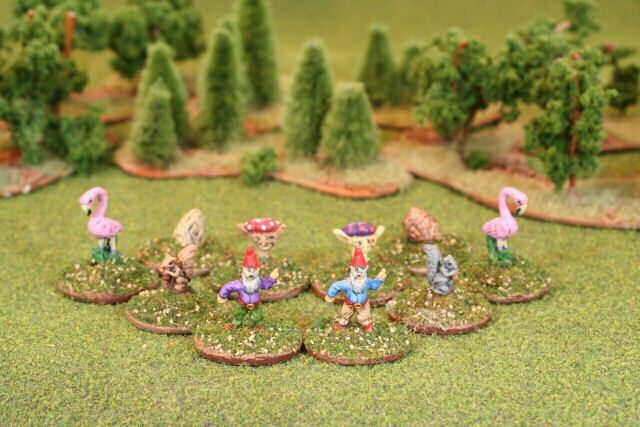 First, we start off with Ginfritter's 28 mm Lawn Ornaments (Fairy004).These are the typical concrete and plastic lawn ornaments yousee in a garden.All the typical lawn ornaments are there: squirrel, flamingo, mushroom,snail, and gnome,or as my wife likes to call them, a "Gee - nome".This is quite an unusual subject for minis, but I immediately took a liking tothe strange topic and bought two sets.To throw a curveball on the whole matter, the tinygnome is flipping the bird.What better way to welcome scrutinizing passerbys to your gardenother than to let the little guys flip the old one-finger salute. "Welcome to my garden. Now sod off!" Here two tiny gnomes meet in the forest and give each other the gnomesalute. 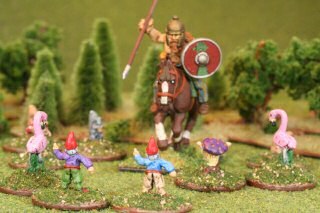 Here some Gnomes and friends fight off an Allemanni Attack circa 50 BC.The chieftain charges.The gnomes form a battle linewith bird-flippers to the front, pink flamingoes providing support,and squirrel nut zippers to the flanks.Mushrooms and snails guard the rear. Who will win this deadly battle? 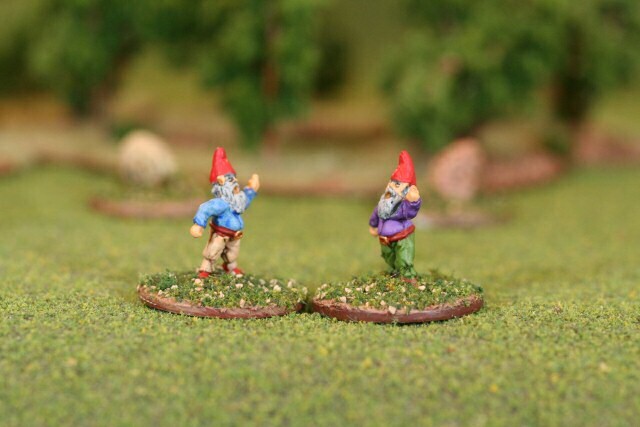 The gnomes have suffered no casualties. Was it luck or was it gnome bird-flipping?Another Allemanni charges from the woods.This time the gnomes regroup and fire off another pair of salutes.What will become of the enraged Allemanni cavalry? 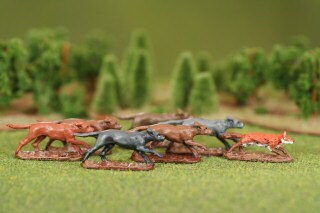 Meanwhile in another part of the forest, some hounds chase a fox.These 28 mm miniatures are fromMega Miniatures.Thanks to my friends Brian and Laurie I have a crisp photo of a foxthat they took on their recent western U.S. roadtrip.The dogs in this photo are modelled on some Labrador retrievers that I like.I guess I should have modelled them on fox hounds.Well, maybe not. Most dogs will chase a fox. Here are some 28 mm snapping alligators again courtesy ofMega Miniatures.I usually do historical battles and Dark Age skirmish games.So why do I need some gators? 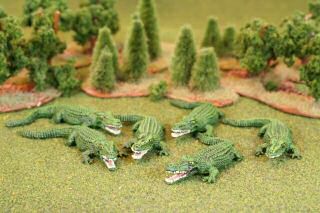 I don't.Actually, they are a gift to my wife, a graduate ofUniversity of Florida and their mascot the gator.Gators in the swamp are not this bright eye-popping green,but they are in the University of Florida mythos.These minis now reside on top of her jewelry boxes and shelves. 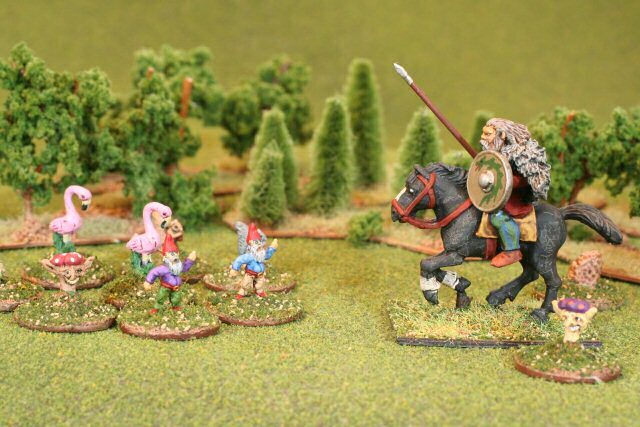 Thanks for visiting and reading about my garden miniatures.More miniatures-related articles are atDan Becker's Miniatures and Models site. Last modified: Thursday, 09-Jun-2011 12:51:36 MST.